As I sit here with my work being quite slow, my mind is racing with different things I can do. I haven’t had to look for work for 16 months and now my mind is starting to wonder if I’ll need to start looking. Anyways, while I sit here at home with 3 children, I realize I depend on work to keep my mind busy. So, what happens when work is a little slower than usual? Your mind starts going off the deep end. 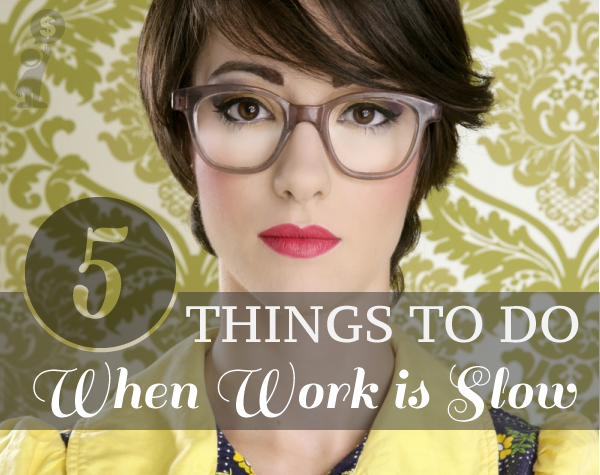 Here are five things you can do when work is slow. Seriously, we are about to move and I looked over at our walls and almost barfed. What is this sticky, gooey, red stuff on these walls? I took it upon myself to wash my walls while work is slow. As humans, we want to eat to live, but lately I’ve been living to eat. The food we have in our house isn’t even all that great. It just seems like meal times are closer together when you are less busy. Luckily, I haven’t been too bad with eating. I’ve been eating bananas, raisins, some cereal. Have you noticed something? I have the appetite of a toddler! I’m eating everything my kids eat. Come on, what is happening to me! I figure since work is slow, this is the perfect time to spend more time with my kids. They’d rather play cars or watch television. Turns out, they don’t need me after all. All those hours of guilt because I’m working is thrown out the window in 2.5 seconds. I really tried to have conversations with my kids and all they can do is do what they normally do. Children. I think that work is like a part of my body now. If it’s slow, then the first step I take is panic, worry, and pacing. In reality this gets nothing done, but it bothers the neighbors downstairs. They can hear every move I make. If I have to suffer with boredom, they shall too suffer. This last idea came to mind, but I’m reluctant. WHY? Well, my job is weird. One day it’s slow and the next day it’s busy. The moment I pick up new gigs is the exact moment my other job will pick up. Right now I’m picking up some work for the main company I work for, Cheeky Monkey Media. If I get around to it, I may start looking for some new work. Give me some motivation, work at home moms! Jess, LOL. I enjoyed a good laugh at your ability to make the most of your situation! The last one is probably the best suggestion. I was taught that even when you have plenty of work, you ALWAYS want to be marketing. I know I haven’t always done that either! But am getting better! I agree with Leisa and you Jess – as a Freelancer you must always be looking for more work. Most of us had to learn pretty early the importance of having multiple streams of income as well as keeping a Plan B, C, D, and E on the back burner.